Slightly different post for you this Monday as I had a lovely labour day weekend off in Portland so I didn't have chance to shoot outfits and write up a post. But beauty posts are one of my faves anyway and I had a lovely delivery from Pixi last week of lovely make up palettes and 2 skincare items which I will be reviewing today, one that I've tried plenty of times before and one newbie to me which I have wanted to try for ages but was a little scared off and I will explain more below. Pixi - Glow Tonic* | A cult pixi product and one that I have bought many times before. My skin drinks this toner in and helps absorb my moisturizer. I can not skip a toner in my routine because my face tends to dry up without it, I love the Glow Tonic for preventing that and also for brightening up my complexion. If you suffer with acne or scarring I would recommend giving this ago because it helped clear up some scarring on my face, it has 5% glycolic acid which is great for pigmentation and scaring. It also has aloe vera and no alcohol so you don't have to worry about your face burning up after if your skin is sensitive like mine. Now the one thing I don't like about this product is the smell and this is a pregnancy thing, ever since finding out I was pregnant the smell of caramel offends me so much and this toner has a super sweet caramel scent. So I'm gonna save this toner till after my pregnancy when my hormones are back to normal and I can enjoy caramel things again. Pixi - Double Cleanse* | Ok so I have wanted to try this for a while mainly because I adore Caroline Hirons and if she loves a product I always wanna try it out for myself! I have never been a double cleanse kinda gal, unless you count a micellar water which most people don't. A solid cleansing oil scared me off in the past because I was worried it would make my oily skin worse and even break me out in spots, also it looked kinda messy! 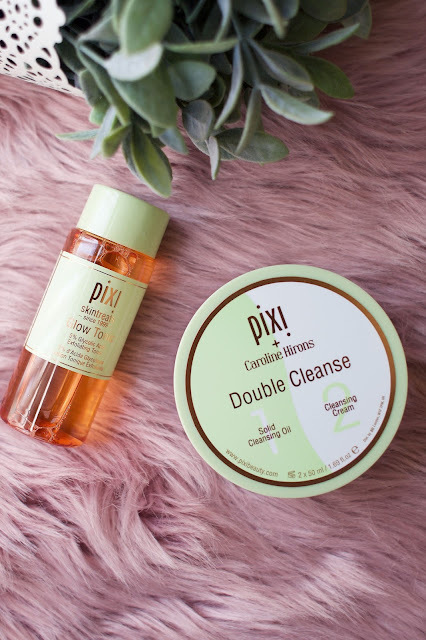 I have tried this double cleanse on no make up days, little make up days and full make up days just so I could get a real feel for the product. Going forward I will only use this for make up days just because I feel like 2 cleanses on a bare face is a waste of product and time. However for make up days it was a dream to use, my make up melted away and it was extremely gentle on my eye make up and after removing the oil with a damp cloth I actually didn't have any mascara left on my lashes or around my eyes which never happens with my other cleansers. The cream cleanser is equally as gentle and removed any left over make up whilst keeping my skin hydrated. I'm totally sold on this, it has lovely ingredients like vitamin C and E and didn't cause any irritation to my skin. The only down side is that you only get 50ml of each product so If you wear make up everyday then I only think this will last you a month max! It will last me longer because I'm way too lazy to apply make up everyday! 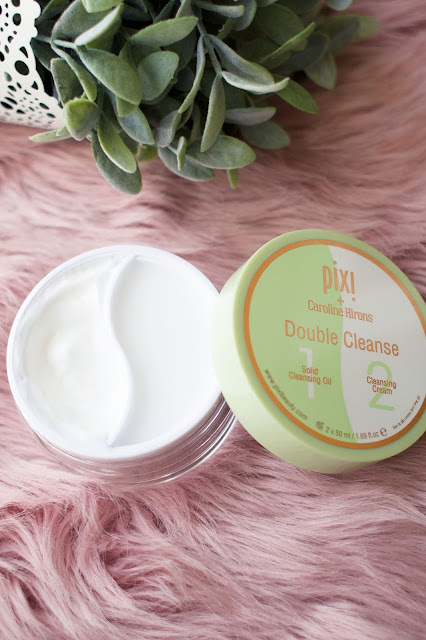 Yes love love love this double cleanse!